O.M.G. You guy, you guys, you guys... I'll let you just take all of that gorgeousness in right there for a moment. Okay. So. 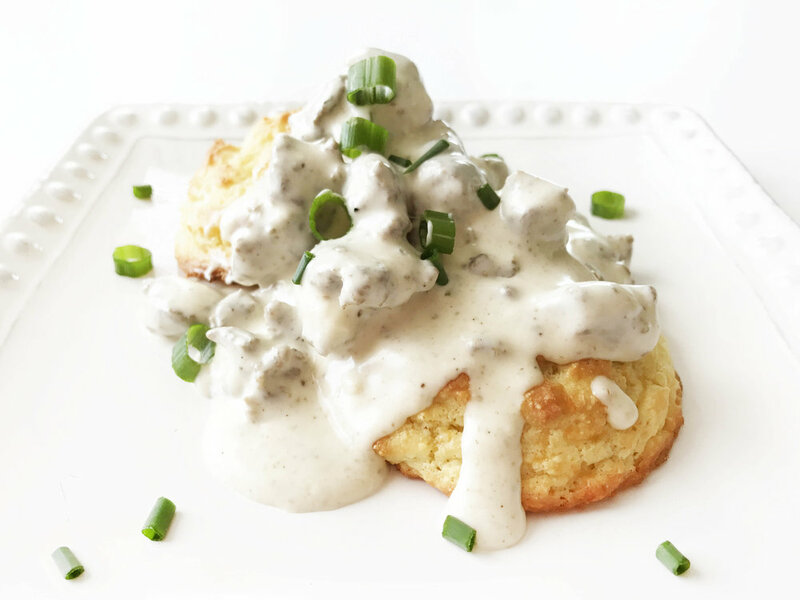 Not only are these biscuits and gravy low-carb and gluten-free, but I have to say that this was some of the best damn biscuits and gravy that I've ever put in my mouth. And those are big words coming from a southern girl. With everything that's been going on here around Austin lately, I needed some good southern comfort food in a bad way this week. I think all of us here did. And there isn't much more southern or comforting than a good plate of biscuits and gravy. For the biscuits, I was more than a little nervous. I've tried my hand at gluten-free 'bread' in the past and to say that it didn't work out as expected would be a vast understatement. These though? They were easy to make and tasted great too! You'll just want to be mindful not to over mix the batter. Mine was -right- on the edge of being over mixed. The gravy? It's rich. I'm not going to lie. It's rich and decadent and so sooo creamy. It really ended up being a perfect consistency. Sometimes I feel like a white gravy is quick to become too thick. This one though stays perfectly pourable and just thick enough to stick to the biscuits and even soak in a little. 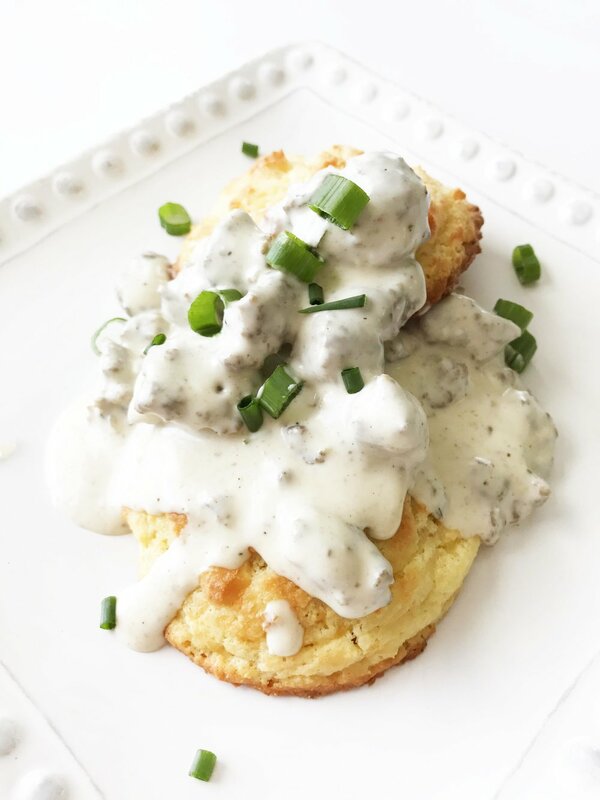 One of the best parts about these biscuits and gravy is that even if you aren't looking for a low-carb or gluten-free meal, it's still easy to make and super SUPER delicious. Preheat the oven to 400 degrees F. and line a baking sheet with foil or a silicone baking mat for easy clean-up and lightly coat with non-stick baking spray. Sift together the 1 1/2 C. Almond Flour, 1 Tbsp. Baking Powder, 1/2 Tsp. Garlic Powder, and 1/4 Tsp. Salt. 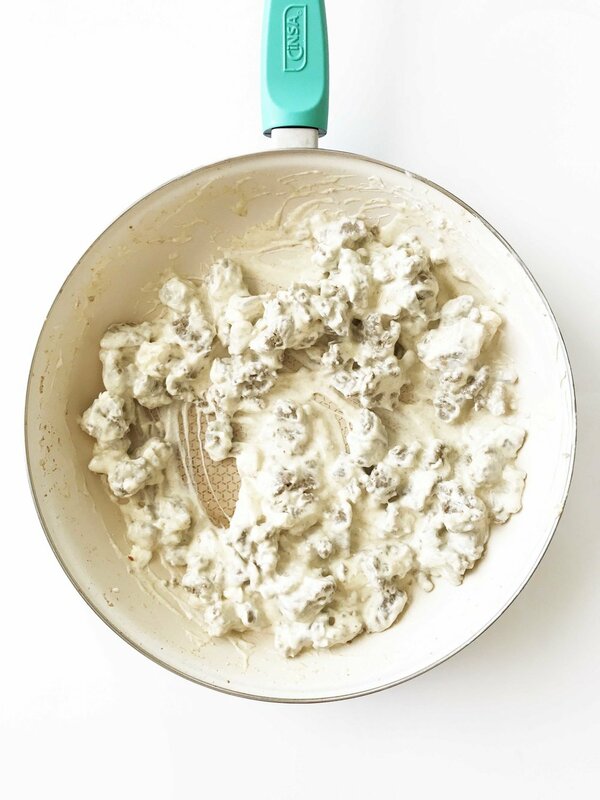 In another bowl, mix together the 1/3 C. Sour Cream, 2 Whole Large Eggs, 4 Tbsp. Butter, and 1/3 C. Shredded Cheddar Cheese until well combined. Add the dry ingredients to the wet ingredients until just combined. Do NOT overmix. Scoop the dough out in about 2 Tbsp. at a time and place onto the prepared baking sheet about 2" apart. Place the baking sheet into the oven and bake for 10-12 minutes or until golden brown on the tops. While the biscuits are baking, brown the 1 Lb. Lean Ground Breakfast Sausage in a large skillet over a medium-high heat. Do NOT drain off. Add the 8 Oz. Softened Cream Cheese and stir until melted. Pour in the 1/2 C. Heavy Cream, 1/2 C. Reduced Fat Milk 1/2 Tsp. Onion Powder, 1/4 Tsp. Salt, and 1/8 Tsp Pepper. Reduce the heat to simmer and continue to cook, stirring constantly for about 5 minutes. Once the biscuits are done, remove them from the oven and cut in half. Top each with about 1/4 C. of the gravy and enjoy right away!